The natural resource arena is losing two influential policymakers from the Northwest. Rep. Doc Hastings, R-Wash., recently announced he would not seek reelection after representing central Washington for 20 years. Hastings has served on the House Committee on Natural Resources since 1995 and as its chair since 2011. Sen. Ron Wyden, D-Ore., last week stepped down as the chair of the Senate Committee on Energy and Natural Resources. Wyden held the chairmanship for a little more than a year and will now take what's widely viewed as a more powerful position as chair of the Senate Committee on Finance. Sen. Mary Landrieu, D-La., will take Wyden's place and is expected to favor pro-industry positions when it comes to legislation related to oil and gas. 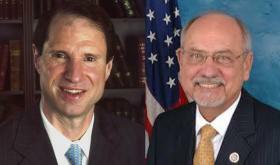 Wyden and Hastings have greatly influenced natural resource policy in the Northwest. Now that could change, said political scientist Jim Moore. "The main thing that we'll see is that the Northwest is not going to be on the front burner on these committees," said Moore, political science professor at Pacific University. "When the chairmen leave, or when people who have a lot of seniority leave a committee, then all of the sudden, the things that were issues back home leave with them." Issues like dam removal and forestry legislation. For years, Hastings has fought to keep the four dams in place on the lower Snake River in southeast Washington. To that end, he pushed a "Save Our Dams" bill last year. Commerce and industry groups say Hastings' retirement is a loss for the region. "He's never been one to shy away from shining the light on issues that can be controversial. . . . He's always been a staunch defender of the Snake River dams because he understand their value not just to the state of Washington, but to the region as a whole," said Terry Flores, executive director of Northwest RiverPartners, which represents farmers, ports, and other businesses and groups that support the Columbia and Snake rivers' hydroelectric dams. On the other hand, environmental groups say they will be watching to see who replaces Hastings. "There's an opportunity right now to change dam operations in a way that could potentially have some real significant benefits," said Michael Garrity, Washington State conservation director for American Rivers. Garrity said Hastings has been instrumental in helping promote a large-scale plan to help conserve water in the Yakima Basin. The plan, known as the Yakima Basin Integrated Management Plan, has been touted by some environmental groups and dogged by others for its proposal to expand some reservoirs by building new dams. For his part, one of Wyden's emphases on the Senate Energy and Natural Resources Committee has been forestry legislation. Oregon Wild's Steve Pedery said Wyden's natural resource work has both benefited and hurt Northwest natural resources. Pedery praised the senator's wilderness bills, like one that protected roughly 200,000 acres near Mount Hood. He also criticized Wyden's handling of some forestry legislation, like payments to timber counties, known as the Secure Rural Schools Program. "People had very high hopes for Ron when he took the gavel of the [Senate] Energy and Natural Resources [Committee], given that background that he'd worked on wilderness, he'd worked on finding good compromise on forest management. I think the reality has been a mixed bag," Pedery said. Moore, who also directs Pacific University's Tom McCall Center for Policy Innovation, said in the end, it's all about power. Moore said Rep. Peter DeFazio, D-Ore., would now be the Northwest's "chief player" for natural resources policy. DeFazio is the senior Democratic member of the House Natural Resources Committee. He said federal dollars for Northwest natural resources programs may actually be easier to come by, with Wyden on the Finance Committee. That's because Wyden may still be able to influence Northwest natural resource policy through his oversight of federal tax and revenue policies. "There are big, giant issues that could have a big impact on energy policy; they could have an impact on access to public lands; they could have an impact on how people relate to public lands, by tinkering with tax policy or by talking about how the budget works in different ways," Moore said.